One of the things you don’t see enough from nonprofits are case studies profiling successful corporate partnerships. Case studies are a powerful source of social proof. They show prospective partners that you are experienced, credible and your partnerships are indeed win-win. Let’s face it: companies want experienced partners. That's why so many companies end up working with St. Jude Children's Research Hospital, Children's Miracle Network or Boys & Girls Clubs of America. These organizations know how to execute corporate partnerships. Case studies are the “proof” companies want to have before they choose to work with you. Now, you may be thinking, When a company wants to hear about a successful partnership I can just tell them about one when I meet with them in person. But that’s not how it works. Companies are looking for case studies on your web site and on your other digital channels long before they ever send you an email or call you. Are you struggling to attract corporate partners? One reason may be that companies have passed on even contacting your nonprofit because they couldn’t find examples of successful corporate partnerships on your web site. Sad, right? Because you have those examples, but you have no home for them on your site. Do you think that nonprofits are "special" and don't need case studies? You’re wrong. You need case studies just as much as businesses do! And they’ll be just as effective for your nonprofit as they are for businesses. But Can’t I Just Write My Own Case Studies? You sure can. But they won’t be as good as the ones I’ll write for you. First, it will be awkward if you do them. Asking a partner to give you feedback directly can be difficult and will actually prevent a partner from being completely open and honest. Second, only from a third-party author will you get a bona fide piece of social proof. My interview will go beyond “So-and-so was great to work with!” to one that focuses on the problems you solved and the business outcomes you achieved for your clients. Third, you’ll actually get the case study done! You may know that you need case studies, but if you haven’t done them yet you’ll probably never do them. Let us do them for you! I’ll conduct a 20-30-minute phone interview with your partner to uncover what they loved about your partnership. I’ll use the client’s answers to create a detailed case study (usually between 350-500 words) highlighting the results the partnership achieved. I’ll handle all the approvals and edits from both you and your partner until we have the final approved text you can use throughout your marketing. I’ll send you a final document of the case study and a summary of any additional partner feedback. Think about the value of this. You’ll get honest, useful insights that you can use to improve your offering, process and/or partnership efforts. There are many others case studies out there. But the case studies we’ve written for clients are for prospective corporate partners - and not for the prying eyes of nonprofit competitors. Frankly, our current nonprofit clients are unhappy that we’ve opened this service to everyone. They know how much of a competitive edge case studies give them with prospects - and competitors! The secret is out. The question is do you want to stay in the dark and not produce the valuable case studies that drive partnership success? Are you ready? Email me at joe@selfishgiving.com. You can target nearly 3,000 corporate partnership professionals and fans from the nonprofit, business and agency world by either sponsoring a link or advertising in my newsletter. The content in my newsletter is carefully curated for corporate partnership professionals. Plus, I restrict my newsletter to active readers. Subscribers who don't open my newsletter for four weeks in a row are removed from the list. I make an appointment with my readers every week, and promptly deliver my newsletter on Wednesdays at at 8 a.m. (ET). I resend it on Fridays at 8 a.m. to subscribers that didn't open the Wednesday email. The newsletter's cumulative average open rate is 45% and the average click-through rate is 9%. Newsletter are archived on my blog where they receive additional views. Subscribers have told me that the Selfish Giving newsletter is their go-to resource for information on cause marketing, corporate partnerships and sponsorship. "It's the only newsletter I have marked VIP so it comes to my attention on my Apple Watch, and is in the same VIP pool as email from my family and close friends. So there you are. Always interesting, relevant, and instructive - I never want to miss it." "I look forward to your email and I’m constantly sharing the good tips and interesting info you share. I literally use some of the info and tips right then and there, as I work through my day, reaching out to prospect funders." "I love your newsletter - the only one I love! I get several and appreciate the info in them, but yours are so baked with info without overload, and not predictable." "I'm a rabid fan of your newsletters!" "Your newsletter is a great way to get your wisdom without hearing your annoying Boston accent. Learn how to talk, will ya? 😂"
You have three options for newsletter sponsorship. (Note: Ads are 600 x 400. Ads appear larger here than they will appear in the newsletter.) Links and advertisements can be used to promote - among other things - content, original research, careers and partnership success stories. 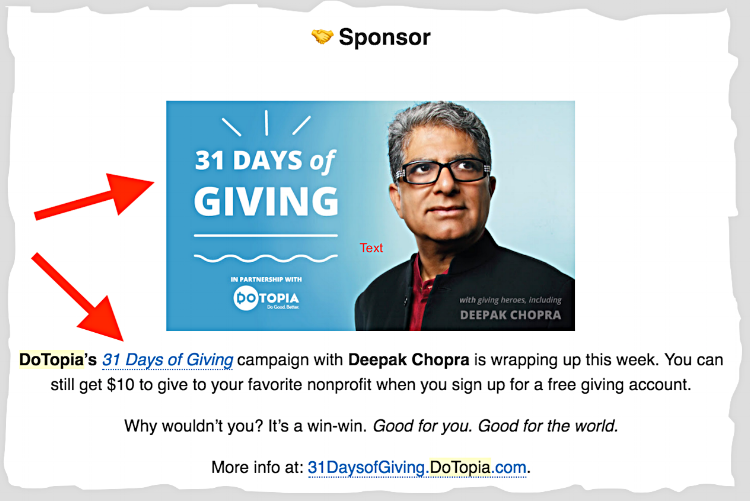 Sponsored posts include a 500-word article on Selfish Giving + a sponsored link in my newsletter + promotion for one week via my Twitter handle. 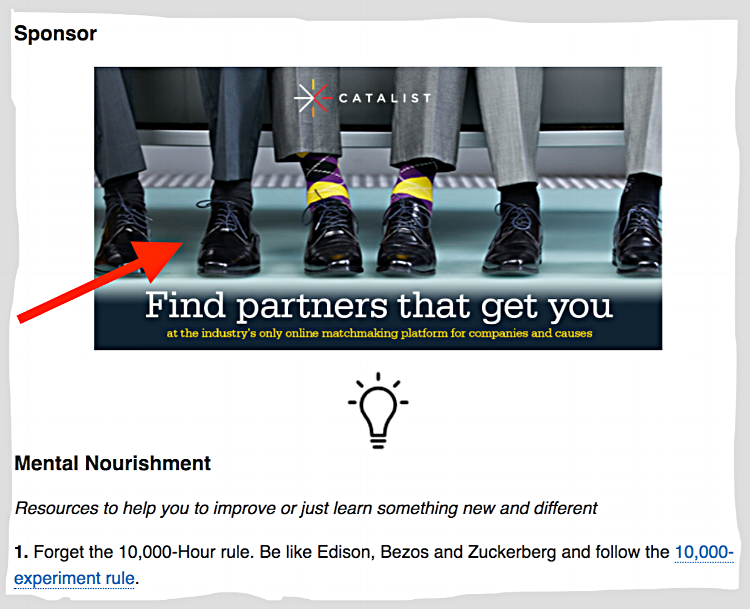 Sponsored posts can include simple ads or sponsored ads in the newsletter for an additional fee. You have two options regarding the content for sponsored posts. First, YOU can submit a 500-word post. I'll edit the post for style and content (posts should inform, not perform) and post it on Selfishgiving.com and promote it in my newsletter and on Twitter. Your investment is $500 per post. For posts over 500-words it's 50 cents per additional word. Second, SELFISH GIVING can write your 500-word post. You'll edit the post for style and content before it's posted on Selfishgiving.com and promoted in the newsletter and on Twitter. Your investment is $1,000 per post. For posts over 500-words it's one dollar per additional word. Additional Offering: Selfish Giving can also create and present Facebook and Instagram ads to our newsletter and blog post audience members who have Facebook and/or Instagram accounts. These ads, which will link to your sponsored post on our site, will provide the opportunity for "repeat exposure" to and reinforce your message with Selfish Giving's audience. You'll select the budget for your campaign and the number of days you want it to run. Your investment will be $500, plus the cost of the advertising media buy. Here are several examples of sponsored posts. Note that Sponsored Posts are identified as paid content in the title and at the bottom of the post. Need more information or want to get started on a sponsored post? Email me at joe@selfishgiving.com.